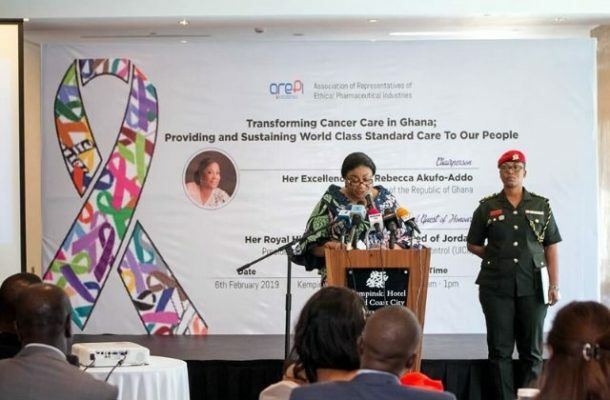 First Lady Mrs Rebecca Akufo-Addo says Ghana needs to boldly confront the financing of cancer treatment in the country to help provide quality care for patients who suffer from the disease. She emphasised the importance of awareness creation on cancers to aid screening and promote early detection in Ghana and in Africa as a whole. “Both the public and private sectors must support our people to have unhindered access to cancer care,” Mrs Akufo-Addo said on Wednesday. Speaking at a cancer conference in Accra, Mrs Akufo-Addo called on both the private and public health insurance players to cover as many cancers as possible in their benefits packages, since the cost of treatment was a big burden to most sufferers. She said the country also needed to invest in financing and the training of more healthcare professionals to acquire the needed skills to manage cancer patients. The conference was organised by the Association of Representatives of Ethical Pharmaceutical Industries (AREPI), a body of multinational pharmaceutical companies operating in Ghana, in collaboration with the Union for International Cancer Control (UICC), the biggest global cancer-fighting organisation. Access Accelerated, made up of biopharmaceutical companies committed to tackling the growing burden of non-communicable diseases in low and middle-income countries, also supported in organizing the conference. It forms part of activities that marked year’s World Cancer Day, observed on February 4, annually, and was attended by Princess Dina Mired, Princess of Jordan and President of UICC. Other stakeholders across the cancer landscape including officials from the Ministry of Health, Ghana Health Service, oncologists, surgeons and patient groups also attended to discuss pertinent issues relating to cancer. A 2018 publication by the International Agency for Research on Cancer states that almost 23,000 cases of new cancers are recorded annually in Ghana. Out of the number, more than 15,000 people die every year. The First Lady described the numbers as alarming since she said those were just the officially recorded numbers. “Imagine the numbers that go unreported and undocumented,” she asked. Mrs Akufo-Addo said not long ago, cancer, which was a relatively unknown disease especially in Africa, had now become a deadly disease plaguing Africans. She said her work as a first lady, in the area of breast and cervical cancers, had revealed several challenges as a country and a continent in improving access to cancer care. Mrs Akufo-Addo mentioned some of the challenges as the availability of infrastructure for the appropriate diagnosis of some cancers, limited specialised healthcare professionals to manage cancers and a limited access to cancer therapies and interventions, as the vast majority of patients have to pay for cancer treatment out of their own pockets. Another major hindrance to cancer care is the limited awareness amongst the general public about the disease. She said although cancer, when detected early with appropriated access to treatment, has a better success rate and outcome, people still sought hospital care when the diseases was advanced compromising their chances at a positive outcome. She, therefore, urged people to seek early medical care to improve their chances for the desired outcomes. Princess Dina Mired, on her part, expressed regret that for some countries including Ghana, cancers meant deaths while in other countries there were no deaths with cancers. She emphasised that access to quality care as well as prevention and awareness creation were critical measures needed to stop the cancer deaths. She said people also needed to change their lifestyles of eating junk food, avoid cancer stigma, while governments must put in the needed regulations, backed with political actions to reduce the prevalence of the disease. Dr Joel Yarney, a Radiation Oncologists of the Korle-Bu Teaching Hospital, Accra, said five per cent of Ghana’s population was now suffering from all forms of cancers, which were part of non-communicable diseases that had been increasing among Ghanaians lately. He, therefore, advised Ghanaians to live healthy lives, eat well and go for regular medical check-ups to help them live long and healthy.